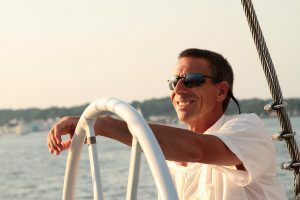 Captain Chris was born and raised in Woods Hole, Cape Cod, Massachusetts. He started boating as a child on a small pond, fishing and sailing. He would, on occasion, accompany his dad during the New York Yacht Club summer cruise. Oh, the stories we cannot tell. It was big work for a 10-year-old as a launch and chase boat deckhand in fair weather and foul. He was also shanghaied at this time by his mother to his oldest brother for the cab fare to race the family’s Cape Cod Knockabout in the Woods Hole channels. In his early teens he taught sailing privately. At sixteen the Captain moved over to maintaining and operating a 38′ private motor yacht. Receiving his USCG Captain’s license at 18 yrs old, he began guiding sport fishing charters in Vineyard and Nantucket sound. After Graduating from Boston University, Captain Chris embarked on a series of voyages. Making many trips up and down the eastern seaboard and offshore to the Caribbean via Bermuda, crewing and captaining both private and charter yachts. A transatlantic passage brought him to Europe, where the captain stepped ashore to try his hand on land. Living and traveling in Europe for several years, he returned to the boating scene only to wash up in Costa Rica for a half a year. This explains the French and Spanish he can speak. After years of work, travel and experience, the captain wanted the perfect job aboard a boat, one without a boss or owner. He purchased the first Liberté, a replica of an 1850’s Pinky Schooner, in 1990. It was the second traditionally-rigged boat he’d ever captained, the first being when he was 12-years-old. Ten years later with a successful business and a family on the way, he and the lovely Miss Jane decided to build a bigger boat to accommodate the family more comfortably, as well as all those folks out there who enjoy sailing with him. And that is how he came to where he is today, on the “new” Liberté. As opposed to the Captain, Miss Jane was not raised near the water. She grew up in Bristol, Connecticut, a good distance inland from the shore. But even then, her favorite adventures were camping trips, visits to her aunt’s house on a lake and the occasional stay at the beach. She graduated from New England College and moved out to York, Maine, buying her first boat and moving aboard. The 1936 40′ Consolidated cabin-cruiser was a huge learning experience as she rebuilt it. At the same time, she worked various jobs in the yachting industry: varnishing, building and maintaining boats, as well as every aspect running marine offices. She eventually got a position working for a high-tech firm, but gave up the “real job” to marry the captain and become his first mate. These days, if she’s not on the boat, she’s spending time with their daughter, Ava. 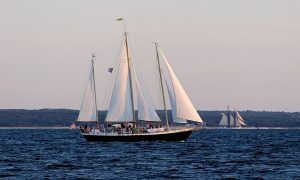 The schooner, Liberté, is based on Spa Creek in Annapolis, Maryland. During the summer months, she’s docked at the Patriot Party Boats pier in Falmouth harbor in Cape Cod, Massachusetts. Captain Chris and Jane had this vessel built just for them. The hull design by Dudley Dix is a Hout Bay 70, a two-masted gaff-rigged schooner intended as a heavy but fast offshore cruiser. The only alterations to these lines are the spoon bow (desired by Jane) and scaling the lines down to meet U.S. Coast Guard parameters. The interior and deck arrangements were designed by Capt. Chris and Jane. Andy Dize interpreted and finalized all of the drawings for the vessel‘s construction. Mr. Dize also produced the ocean engineering for ABS scantlings, structural members, machinery installations and the incline experiment. The sails and rigging were designed by Capt Chris. The hull was constructed by Howdy Bailey of Global Yachts, Little Creek, Norfolk, Va. The masts were constructed by Ron Russell of Russell Fabrication in Shadyside, MD. Vessel commissioned by Capt. Chris, including building the booms and interior. We were influenced by three basic factors: the vessel had to be approved by the U.S. Coast Guard to carry 49 passengers as that had been our business for 12 years; we lived aboard, so this would also be our home; we dreamt of doing a world cruise, so we needed a vessel capable of crossing oceans. We also wanted an engine that would be large enough to maneuver near docks and push the vessel beyond hull speed if there was no wind. POSH (power, offshore, sailing, house) became our guidelines. For power, the 135hp engine gets her going at about 9 knots at top speed, a little over her 8½ knot hull speed. One can also “kick” the stern around and stop the boat quickly. Being offshore puts other demands on the boat. Dudley Dix did a tremendous job designing smooth slippery lines. The large rudder gives excellent control. A collision bulkhead was installed for the U.S. Coast Guard and we added three more bulkheads to control flooding as the vessel should be its own best lifeboat. Sailing the vessel needed to be physically easy for one person. L. Francis Herreshoff inspired the rig. The Dix design called for a two-masted gaff-rigged schooner. Having sailed for the past 12 years with my original boat, I knew that the gaffs can be heavy and cumbersome offshore. (In other words, heavy and dangerous labor on a dark and stormy night did not inspire me.) Though not as efficient as large sails, the smaller sails are much easier to manage and provide many more variations depending on wind velocity, sea state and the direction the vessel is headed. She has proven to be fun to sail. Traditional rigging techniques were used for their durability and simplicity of design. As for house, it is at the bottom of the page but not the list. The deck of the vessel is our porch. It is important to have plenty of comfortable places to sit and kick back. It was also important to have plenty of open deck space. There are over sixty seats on the deck of Liberté, yet a wheelchair can easily be accommodated. We wanted to be able to serve large buffets and more intimate sit-down dinners for twelve alfresco while sailing. We can do that too. Above all, the view from our porch is fantastic. Below decks there is plenty of headroom, as much as six feet eight inches, no less than six feet three inches. The great room is seventeen feet by seventeen feet. A large, well-equipped galley will keep the crew happy offshore as well as allow for catering. There are two equivalent split cabins under the foredeck, a crew’s quarters forward and a large master stateroom aft. Visit with us and share the magic.